A question arose about the “level of intensity”. What exactly did it mean? The class agreed that it meant how intensely true you are—to whatever you are. Later, in a faculty meeting, Chic Street Man defined intensity as your level of “willingness to connect with your audience”. The class decided that “intensity” shouldn’t translate into a false physicality: an intensity level 10 isn’t about shouting or waving your arms. It’s about communicating even a soft idea as vividly as you can – like an ember still burning in the fireplace. 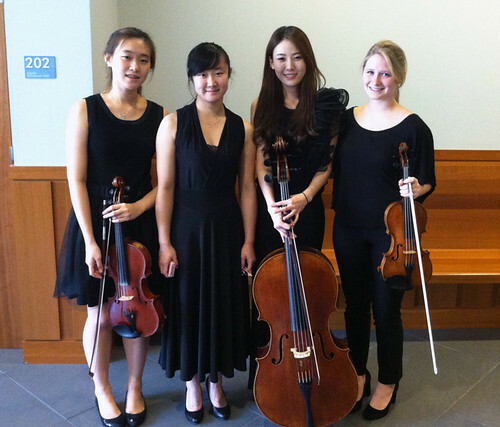 Related: Read my 2009 blog about being a student at the Heifetz Festival. This essay first appeared on Violinist.com. Beware…sleep-practicing can be dangerous. It did devastating things to this girl’s bowhold. A for effort, Sleepy’s. This is an accurate portrayal of me whenever I try to practice before 10 am, anyway. 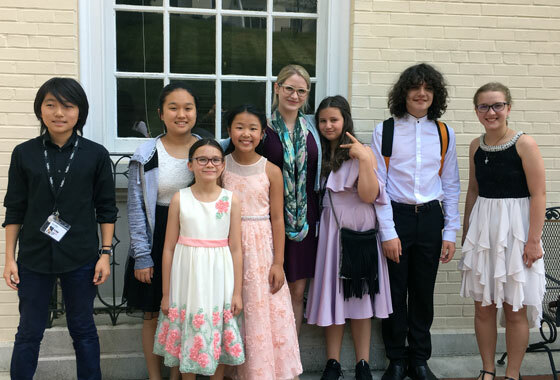 This month, I had the chance to participate in a brand new music festival: the Sejong International Music Festival, held at the Curtis Institute of Music, in my hometown, Philadelphia. One of my favorite things in the world is to play with other musicians, especially in small ensembles. This past week, I had the chance to do a very different, and for me, very new kind of collaboration. I’ve always loved interdisciplinary projects, and had the opportunity to join forces with an aerial acrobatics company. No, I was not hanging from a trapeze. 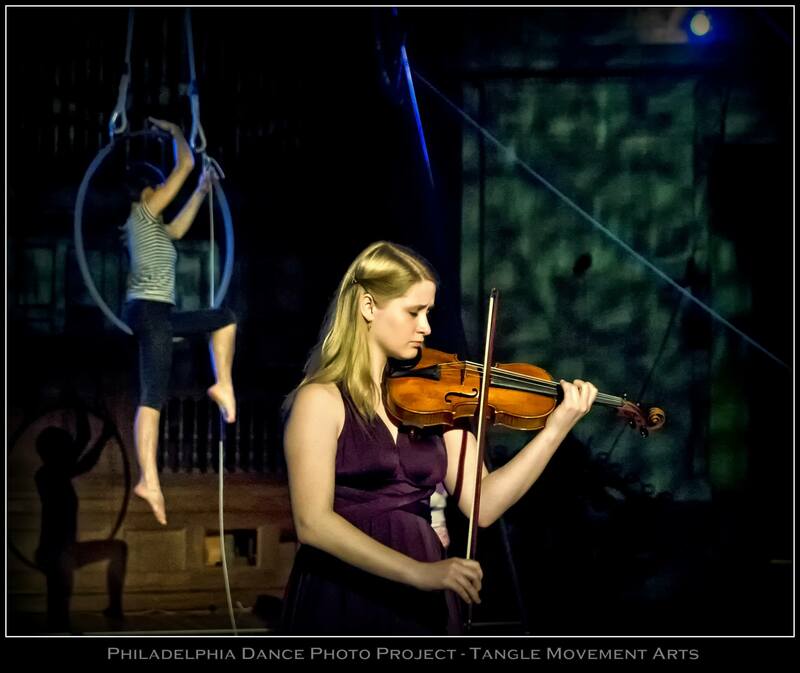 I was playing alongside the performers of Tangle Movement Arts, a Philadelphia-based aerial acrobatic theater company founded by my sister, Lauren Rile Smith. The show, titled INVERT!, took place at the Rotunda, a huge, dome-shaped former church sanctuary near the University of Pennsylvania campus. 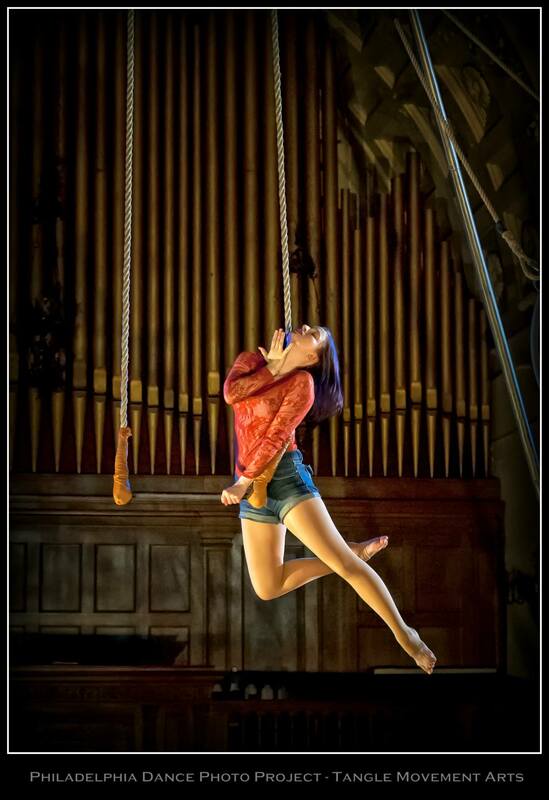 I performed a series of brief intermezzos by Paganini, Bach, Piazzolla, Massenet, and a piece by Melissa Dunphy between daring and brilliant feminist-inspired acts on trapeze, lyra (hoop), and rope. The huge organ pipes in the background created a dramatic backdrop. In the photo below, my younger sister, Pascale Smith, also a Tangle member, performs on the trapeze while reciting a Marilyn Hacker poem. These wonderful photos are courtesy of the Philadelphia Dance Photo Project. 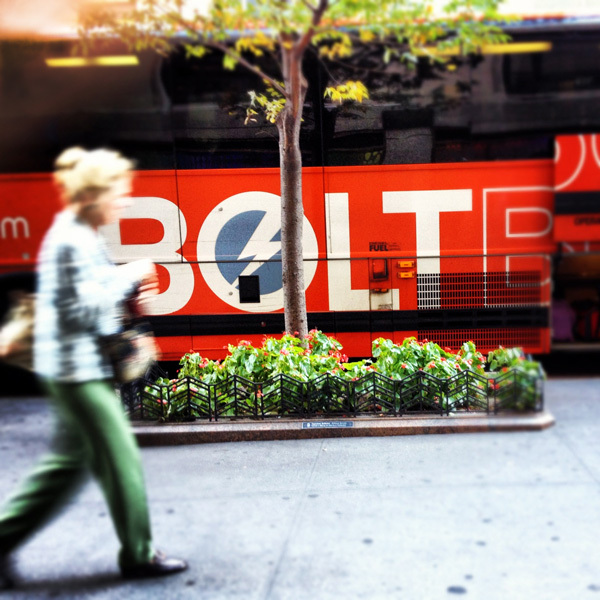 I’m a frequent rider on the Bolt Bus. For ten dollars a pop, I travel between NYC, where I go to school, and Philadelphia, the city where my family lives. I ride the Bolt Bus at least two dozen times a year, traveling for performances and holidays, but also whenever I’m desperate to get away from the pressures of school and unwind in my cozy, childhood home. 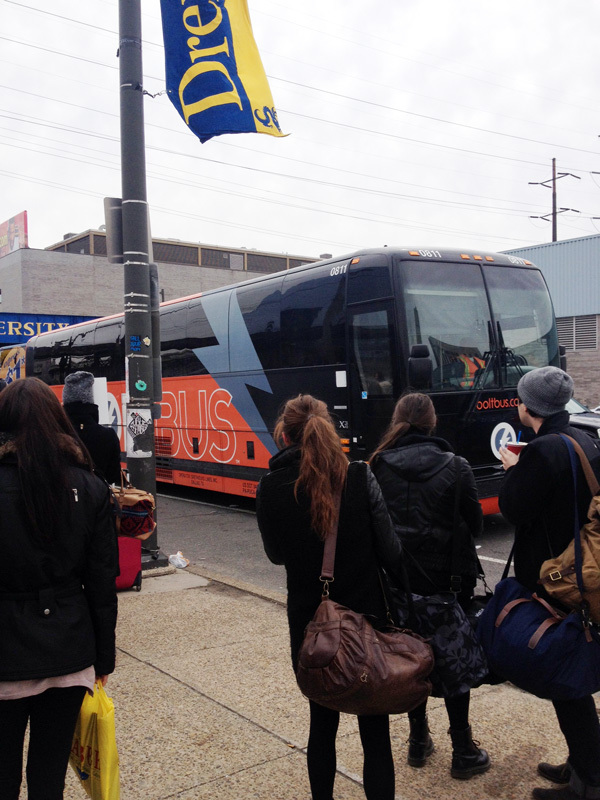 Unlike the dark, smooth ride of the Amtrak trains that run on a parallel, but far more expensive route down the northeast corridor, the Bolt Bus is unpredictable. You can trust that you’ll probably make it to New York or back within a few hours, give or take a restroom that’s filled with vomit. But you could get stuck in traffic on the New Jersey Turnpike for a couple hours. And Bolt Busses sometimes break down. You get what you pay for. Bolt Bus drivers range in disposition from jolly and enthusiastic to grim and silent. I remember a garrulous driver who broadcast her personal philosophies on discipline and child-rearing over the loudspeaker for an hour, as well as a surly driver who demanded to know if my friend and I would be “yelling with each other the whole damn ride” because we were chatting happily in the seat behind him before the bus pulled out. I’ve had a delightful assortment of seatmates. I’ve met fellow musicians and enjoyed inspiring conversations about art. I’ve sat next to all sorts of people who want to reminisce about growing up in Philadelphia. I’ve met bevies of college students eager to share tales of their night of mischief in the big city. Once, I played Scrabble on a laptop with a banking intern all the way to New York. Another time I sat next to a mysterious person who held a conversation beneath the privacy of his or her enormous winter parka throughout the whole ride, never coming up for air—I never even got a glimpse of my seatmate’s face. When I don’t have a colorful neighbor to keep me company, I fall asleep. I can fall asleep very quickly, no matter where I am and how noisy it is. I sleep especially deeply on bus rides, lulled by the hum of the engine and the feel of the road. More than a few times, I’ve been poked awake by a little old lady after falling asleep on her shoulder. On a recent trip home, I was awakened by a loud bang, certain my violin was tumbling out of the overhead compartment. My reaction to this terrifying possibility was to emit a spectacular gasp, which startled everyone around me, particularly the guy roughly my age sitting next to me. (I realized later that my fellow riders probably didn’t know I had been asleep, which would make my reaction seem quite odd.) The noise turned out to be a loose armrest falling into position. Struggling to explain myself, I babbled to my seatmate about my violin, and tried to apologize. He murmured some acknowledgement and went back to trying to beat his high score on Temple Run. About twenty minutes later he took a phone call, and told a friend in what he thought must have been a quiet voice that “the girl sitting next to me is really nutty.” I was thrilled when the bus finally pulled up beside Philadelphia’s 30th Street Station, and I could escape with my violin and backpack, into the anonymous bustle of my home city. During my last two years of high school, I was a student in Juilliard’s Pre-College Program, which meant, among other things, getting up at 6 AM every Saturday morning to travel to 65th and Broadway from my hometown, Philadelphia. Despite the early mornings and the four hours spent on the New Jersey Turnpike each week, I absolutely loved Pre-College. I adored my teachers and made tons of new friends that shared my passion for music – and getting to spend part of my weekend in New York City wasn’t bad either. Like many of the other seniors in my Pre-College class, I hoped to be accepted to the college division and continue my studies at Juilliard. We never saw much of the college students during our invasion on Saturdays. In fact, I’d been told more than once that they avoided the music building like the plague on that particular day of the week (which, only one month into my first year, I already understand completely). The college students always seemed to hold a certain mystique for me – how glamorous and exciting it must be to live right on Lincoln Center, and perform as a member of the Juilliard Orchestra on stages such as Avery Fisher Hall (and even Carnegie Hall!) I looked up to these alluring, accomplished individuals and hoped to become one myself. Even though I came to the school every week, I had a feeling that being in the college was a completely different experience. And I was completely right. My first days as a college student at Juilliard were formidable, but once I settled in and made some new friends, I felt right at home. Getting to know the other students in the dorm was one of the best parts of orientation – now my friends included not only musicians, but dancers and actors as well! My roommate and I (we live the 23rd floor of the residence building – with a great view!) bonded quickly and have a ton of fun with the other girls in our suite. But my fabulous colleagues are only one part of what makes Juilliard so great. As part of the Juilliard Orchestra, we have the opportunity to work with incredible guest conductors such as James Levine and Alan Gilbert (I’ll be playing Mahler’s 9th symphony under him next spring). Later this month, students from the Sydney Conservatorium will unite with students from Juilliard for a special joint performance in Alice Tully Hall. As for location, you couldn’t ask for a better place to live as a young, developing artist – we’re surrounded by the New York City Ballet, the Metropolitan Opera, and the New York Philharmonic – and it’s easy to get cheap, student rush tickets to incredible performances. And there are, of course, tons of other perks to living in Lincoln Center – within my first month, I’ve already gotten to see models strutting around during Mercedes-Benz Fashion Week, and caught glimpses of Blake Lively and Leighton Meester while Gossip Girl was being filmed outside of the Met, right next door! My perspective of Juilliard has completely changed as a college student. The offices, hallways, and classrooms that I hadn’t used or known about at Pre-College had before seemed daunting and scary. But I quickly realized that the entire administration is made of friendly, helpful people, and that fellow students are exactly the kind of people that I always wanted to be around in college – wonderful, talented individuals who are wholly passionate about their art. I know there are many Pre-College students in their senior year of high school who are interested in applying to Juilliard, and I couldn’t encourage you enough. However much you may love Juilliard now, it won’t compare to your experiences as a college student. Now that I’m here as one of them, I can’t imagine myself in a better place – and I couldn’t be happier!